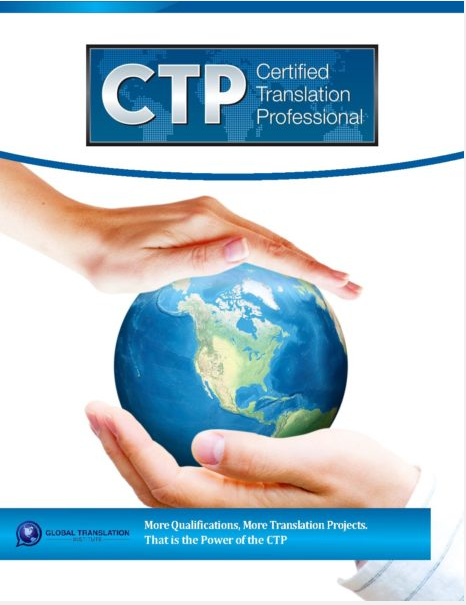 To register for the Certified Translation Professional (CTP) Program, please complete the form below or submit to us a Check Payment Form in the mail or Credit Card Order Form via email or fax (Microsoft Word format) By registering now you will be able to complete our online certification program, get lifetime access to our training platform, and are able to complete the examination process to become a Certified Translation Professional (CTP). Need a Payment Plan? If you would like to pay 8 monthly payments of $98.50 a month, please click here. Trouble Registering? If you can’t or don’t like to use your credit card online, you may use our Mail-In-Registration or Fax Credit Card Form. You may also call us at (305) 503-9050 during Pacific Standard Time business hours to place your order over the phone. Risk Free: The CTP Program includes a 7- week, no questions asked, money back guarantee. That means if you register today for this program, try it out and decide it is not for you, we will refund all of your money back to you immediately. This way you get to try out our program, explore the benefits and resources, and see if it is right for you. By registering you will also gain instant access to our exclusive Expert Translator Interview Series, Career Coaching Services, Translator Resume Template, CTP Study Guide, Book Reviews, Directory of 1,000+ Translation Firms, Author Rights to BecomeATranslator.com, Resume Feedback Services, Audio CTP Study Tips, and 50 Translator Training Video Modules. The translator training video modules and expert audio interviews included within this training are worth over $900 by themselves even though our total program tuition for the complete CTP program is just $675. To show you the high quality nature of our audio and video resources we have made a few available for your reviewing for free, download our sample video in Mp4 format here, and our sample expert audio interview in Mp3 format here. Please note: Refunds will not be made after an examination has been scheduled and the examination has been sent to a participant to complete. Once you submit your examination date request and are subsequently sent the online examination to complete, your refund period will be voided. This means that, should you register and take your examination just 3 weeks later, your refund period will no longer be extended to 7 weeks. If you have any questions about this policy, please let us know.